Starring: Casey Affleck, Chiwetel Ejiofor, Woody Harrelson, Anthony Mackie, Aaron Paul, Norman Reedus, Clifton Collins Jr, Kate Winslet, Gal Gadot, Teresa Palmer, Michael Kenneth Williams, Michelle Ang, Terence Rosemore. “You’re a bank manager. You should be smart enough to know that the monster has gone digital. Be careful what you instagoogletweetface”. After his relentlessly grim debut The Proposition and it’s equally grim follow-up, The Road, director John Hillcoat carved a reputation as a less than cheery filmmaker. However, he was clearly one with an undeniable ability to capture a time and place. His third feature – Lawless – proved again that he had a great eye for detail – even though it was lacking a depth of narrative. 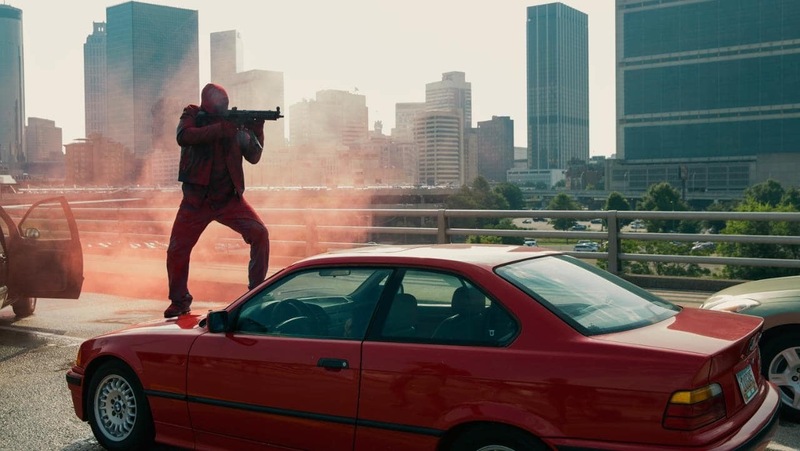 With Triple 9, Hillcoat, yet again, showcases his gritty realism but it suffers the same problems in terms of the story. Plot: Blackmailed by Russian mobsters, a gang of crooked cops, led by Terrell Tompkins (Chiwetel Ejiofor), plan the murder of transfer officer Chris Allen (Casey Affleck) in order to buy themselves time to pull off an audacious heist. Within moments of Hillcoat’s crime yarn taking place there are instant reminders of Michael Mann’s Heat and the precision in which its characters carry out their bank heist. It’s an explosive and very involving start to the film. Soon after, the opening credits display name after name of quality actors. The ingredients are here and there’s no doubt about that from the offset. 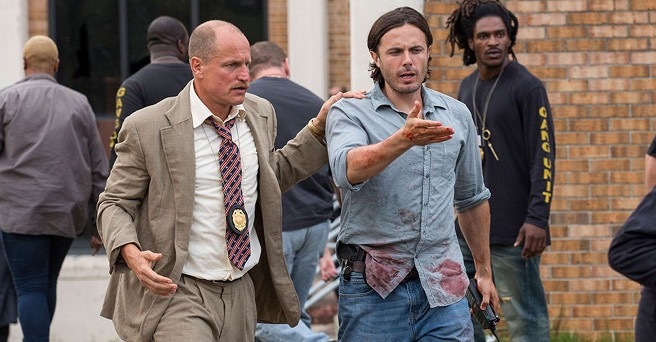 That said, the critics have not been favourable to Triple 9 which had led to me putting it off for so long. Sometimes when this is the case, though, it can lower your expectations of a film and you can approach it with an open mind. I didn’t expect much from this and I’m glad I didn’t as it delivered many positives for me. For a start, the acting is, as expected, top drawer; Affleck, Harrelson and Ejiofor deliver solid work and it’s good to see TV stars Aaron Paul and Norman Reedus breakthrough even if they’re essentially rehashing their roles from Breaking Bad and The Walking Dead, respectively. Needless to say, it’s a male dominated environment but that doesn’t stop Kate Winslet from stealing every scene she appears in as a ballbreaking Russian mob boss. For the most part, everything comes together wonderfully; Hillcoat’s direction is kinetic and his action set-pieces are brilliantly handled with the aid of Dylan Tichenor’s skillful editing and Nikolas Karakatsanis’ sharp cinematography. The action moments here rival the aforementioned Heat but what’s missing is an attention to plot and characterisation: the very thing that made Heat such a benchmark. 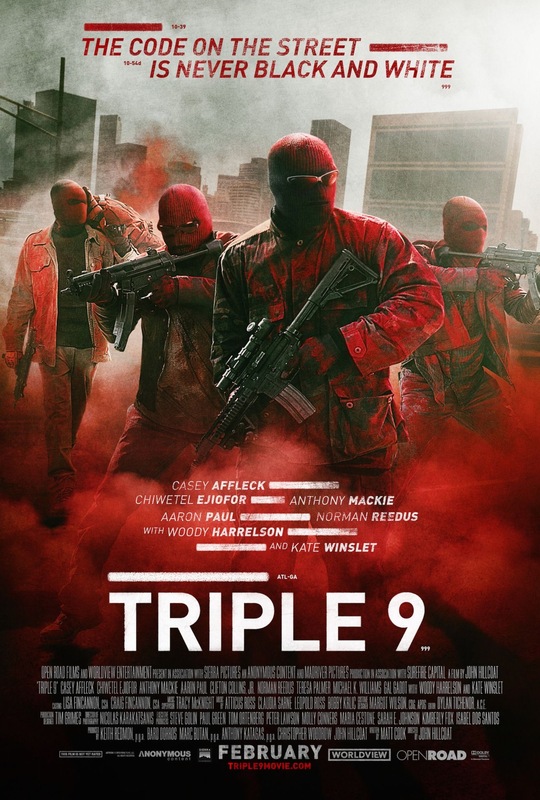 Triple 9 simply lacks it and that’s where I can find agreement with the film’s critics. Character development is nonexistent and for a film that’s close to 2 hours, it really shouldn’t be as aloof as it is. Some plot strands and character interactions don’t make sense at all and it can often leave you wondering if some of the film has ended up in the cutting room floor as it wouldn’t have been difficult to take a few extra minutes to explain the relationship of the characters in a little more depth. It’s a real shame that it’s not quite the sum of its parts as the action is expertly handled and the cast, under Hillcoat’s watchful eye, are outstanding. In the end, though, it’s Matt Cook’s incoherent muddle of a screenplay that lets them down. There’s an old saying that too many cooks can spoil a broth but in this case it took only one. Despite the weak script, though, I still admired plenty about this gritty cops-and-robbers yarn and it certainly isn’t the write-off that it’s been burdened with. When all is said and done, the poor writing didn’t spoil my enjoyment or take too much away from the abundance of quality elsewhere. Trivia: There was a lot of cast reshuffling throughout production; Chris Pine and Jeff Bridges were attached to the project in the early stages. Christoph Waltz dropped out. Shia LaBeouf was originally cast, but had to drop out. Charlie Hunnam was then cast, but then was later replaced by Casey Affleck. Michael B. Jordan was originally cast but he dropped out and was replaced by Anthony Mackie and Cate Blanchett was cast but dropped out due to scheduling conflicts. Kate Winslet replaced her. This entry was posted on June 27, 2017 at 8:15 pm and is filed under Action, Crime with tags 2016. You can follow any responses to this entry through the RSS 2.0 feed. You can leave a response, or trackback from your own site. I agree. There’s a great crime saga buried here. Another attempt at a HEAT-like feature, which kind of reminds me of the frustrating TAKERS (2010) in its final form. This looks like something Hillcoat attempted to bring out, had the conflicts you’ve listed, and the studio stepped in to salvage what it could. And the results speak for themselves. Yeah, I liked it Michael but it could have been a potential classic had a little more care and attention went into the characters. I didn’t see Takers but I was drawn to it for Matt Dillon’s sake. (Sometimes he can end up in some good little sleepers). That said, id be right up for a directors cut if Hillcoat ever released one. Another hour of characterisation and a few nuts and bolts tightened on the script and this would be fantastic. Still haven’t got round to this in spite of the fact that it looks completely up my street. And waht a cast! I liked it, buddy. Many didn’t, though. I did find fault in it as many critics pointed out but it was still a very entertaining piece of work. Really enjoyed this, definitely shades of Heat, but it dragged on towards the end. I’d rather there were more heists, I love a good robbery! Nice write up buddy. Yeah, more heists would have been great. The ones that were there were done brilliantly. Definitely felt like Heat and I think the critics were overly harsh on this film. It had plenty to offer. There a few things I didn’t get with the characters. I had no idea why Harrelson took so much of an interest in Affleck and then it turned out they were cousins or something. They just snuck that in there. I also couldn’t work out if Ejiofor was a cop or just working with cops. ?? I’m sure woody was his uncle, and ejiofor was a spec ops or seal with reedus and they worked with crooked cops to do heists. I think. Ah! I knew there was some relation but it wasn’t exactly clear. Just shows how the film was either butchered in the editing room or just lazily written. Doesn’t matter, though. I still liked it. Pretty sure it’s mentioned early on…… I’ve seen it twice though so maybe picked it up second time round. Same though, regardless I really enjoyed it. Yeah, it a good flick. Like Michael mentioned earlier in the comments, I would be very interested in an extended directors cut if it’s available sometime down the line. I think I’ll watch this primarily for the cast, if nothing else. The cast are great, Vinnie. The film is good aswell despite its faults in the screenplay and the characterisation. I still really enjoyed it, though. You’re a great movie blogger, Mark. I very much enjoy conversing with you. Cheers man! I’m just appreciative of anyone stopping by. Back in the day, I used to be a machine conversing with people but I just don’t have the same time anymore. I totally understand, Mark. I’ll always stop by here. Anytime you get, my blogs are open.